Typing with the onscreen keyboard Onboard on a system with German default layout immediately switches the keyboard layout to 'English (US)'. Touching any key on a physical keyboard switches back to the German default. This can be repeated indefinitely. Onboard uses XTestFakeKeyEvent to send key events. When switching from a physical keyboard to Onboard, the first call to this function leads to an unwanted MappingNotify event and the keyboard map changes from 'pc+de+inet(evdev)', 'German' to 'pc+us+inet(evdev)', 'English (US)'. Pressing any key on an attached USB keyboard switches back to 'pc+de+inet(evdev)', 'German'. Restarting X brings back the unwanted layout switches. xev log of pressing the space bar once in Onboard and another time on an USB keyboard. Note unexpected MappingNotify events before the two KeyPress events. FWIW, here is a gdb backtrace with a break point set on XkbSendLegacyMapNotify, probably the source of the MappingNotify event. Apparently the keyboard device changes from physical to on-screen keyboard and the two devices don't share the same keyboard map (?). This appears to affect anything which uses XTestFakeKeyEvent. For example, I use KeePassX, a password database with auto-type functionality (apparently implemented with XTestFakeKeyEvent). My keyboard is set to United Kingdom, yet when I use auto-type with (for example) a username including an ampersand (<email address hidden>) the ampersand becomes a double-quote (i.e. it enters someone"somewhere.org instead - the double-quote on a US keyboard is where the ampersand is on a UK keyboard). From reading a couple of forum posts it would appear Synergy (a cross-platform keyboard/mouse sharing application) is affected as well. The "setxkbmap" workaround mentioned in the report fixes the issue temporarily for KeePassX (and apparently Synergy), but it would be nice to have something more permanent. I first noticed this with Oneiric (auto-type worked fine under Lucid, Maverick and Natty). I have exactly the same problem with KeePassX in oneiric. The setxkbmap workaround works. But how can this command been run automatically? KeepassX exhibits the same behaviour for me in 11.10 (64 bit) (English UK - keyboard layout). Specifically the @ and " symbols are transposed when using KepassX's Auto-type function. System Settings - Keyboard layout - Hit the " + " button (bottom left of window pane) - select another keyboard layout. I can confirm that this is still an issue with the current release of Ubuntu and onboard. I am using a German keyboard layout, and onboard still switches to a default layout when typing any key. The "setxkbmap" workaround does indeed work for the current session. Confirming too. I've tested my freshly updated Oneiric installs and the layout switches are still occurring for Onboard and kvkbd. Other distributions appear to be affected too, I've seen this happening with Onboard on Mandriva 2011 (under KDE) recently. It does not happen if you just add a second keyboard layout. 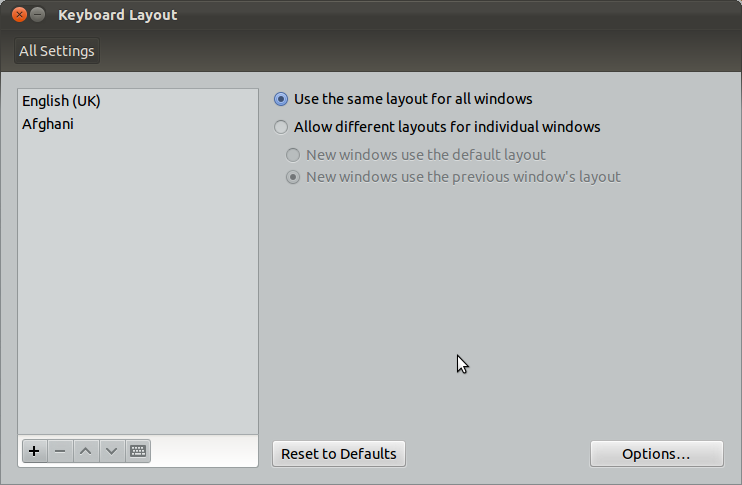 My default layout is de and I just add en to the system settings. Now Onboard always uses the German layout. I can confirm both this bug and burli’s workaround with current Precise. Could you please tell us whether you still get the correct layout with your work around after restarting the computer without doing any new manipulation in the keyboard settings? I have three layouts defined without the US layout; when I change something in the keyboard settings, I get the correct layout; however, after restarting the computer, Onboard displays the US layout. I added the US layout to my three layouts and Onboard showed the correct layout, even after restarting the computer. Then I removed the US layout from my layouts lists in the keyboard settings pane of the System Settings and Onboard continued to show the correct layout. Afterwards I clicked on the "Restore to Defaults" button, and restarted the computer. Onboard showed again the US layout, even if it was not in the list with my layouts. Auto-type replacing @ with " for UK keyboard seems to be fixed in PP-12.04 Beta 1. No need for second keyboard workaround anymore. I'm sorry for asking, but bug reported one year ago. Why its not fixed? I think that it's high importance bug, because while it not fixed many people can't use onscreen keyboard like Onboard or Florence. Hi. I can confirm this situation on Lubuntu 17.10 with onboard-1.4.1-2ubuntu1 installed and Spanish keyboard configured (localectl set-keymap es). No need for clients generating synthetic keyboard events: just using onboard, any key, will switch it back to 'us' layout. Same: any physical keyboard usage will switch the system back to the correct layout. This is a quite barebones installation for a kiosk; I'm not using fcitx nor any other fancy IM subsystem. Before removing fcitx, I didn't notice this bug. It seems like fcitx kept onboard at bay. Issuing setxkbmap es at the start of the session (in my case in ~/.config/lxsession/Lubuntu/autostart) fixed the problem AFAICT. Otherwise, I'm VERY happy with onboard and its flexibility. So far I have been able to overcome all of its quirks and take advantage of its power, without any need to patch the code. We have custom layout, theme and colors. Again, very happy with it.